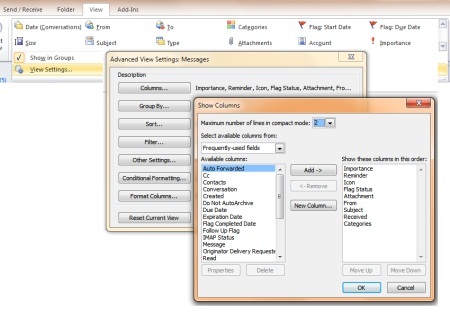 Eric Legault shares the VBA code that can be used when "Organizing Your E-mail Using Custom Item Context Menus in Outlook 2007". May appear to be daunting, but if you have had some exposure to VBA, it's not that bad. Scott Hanselman (who is ". . . an old fat guy with a Black Belt that used to fit") has a tutorial on how to disable "Reply to All". Outlook-Tips.net was put together by Diane Poremsky. While it covers Outlook 2003, the advice is still good.
. . . you can view your days and weeks in increments of 5 minutes, 60 minutes, and a variety of periods in between. You can adjust the view of your calendar according to your work week and work day; for instance, you can display Sunday through Thursday and show a normal day as being 11 in the morning to 7 in the evening if you like. Use different color schemes, and show more or less detail in your calendar. "Signatures can be created in different formats and it can contain various elements. A basic signature will have just the sender's name. Along with the name you can include acknowledgments like "Thank you", "Yours Lovingly", etc. Official or business signatures will have company name, contact number, company address, website URL, etc. Company logo or any other relevant graphic can also be used. Any text in the signature can be hyperlinked. Sometimes electronic business card or scanned signature is also used. The text of the signature can be formatted to make it more attractive. Occasionally signature will also contain disclaimer blocks like stating, "If you are not the intended recipient of the e-mail then you should delete the e-mail". It is sometimes necessary to move Outlook .PST files to a different drive on your local computer.
" Email is a quick, cheap and easy means of communication. This makes email a great business tool, but at the same time a potential threat for employers. Email threats such as confidentiality breaches, legal liability, lost productivity and damage to reputation cost companies millions of dollars each year. How can a company protect itself from these threats? The first step in securing your company is to create an email usage policy. After you have created your email policy you must make sure it is actually implemented. This can be done by giving regular trainings and by monitoring employees' email using email security software. " You may find it useful when trying to develop your own E-mail policy. If you have a photo on your computer, from a digital camera or something that has been scanned to produce a JPG, GIF, or PNG file. Send the photo as an attachment to an email. It'll show up as an icon at the top of the email for the receiver to click and open in their picture viewer. This is the most common option. Embed the photo into a HTML formatted message so it appears in the text of the message just like a photo in a newspaper article. This looks nicer for people who want to read the message and not necessarily work with the photo file. But there are compatibility issues to keep in mind. Whichever way you choose, you need to keep an eye on the overall size of the message. With higher resolution cameras available it's easy to go over the recipient's limit for incoming messages. If you preview or open an e-mail message with this type of an image reference, this action may make you a target to receive more junk e-mail messages. To prevent this type of Web beacon, where an HTML e-mail message contains references such as links and banners to an external URL, the Outlook 2003 HTML viewer does not automatically render the external content. Instead, when you view the e-mail message, areas in the e-mail message that should have a picture appear as a red X placeholder. Click here to download pictures. of some pictures in this message. 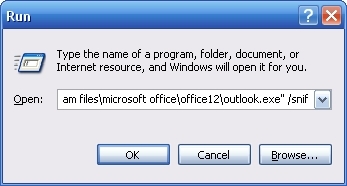 When Office 2003 was released, the only application that showed obvious changes from the earlier version was Outlook. Slipstick.com does a good job describing the changes and providing useful links. There is an apocryphal story that when Outlook was first considered, it was a PDA, kind of an electronic date book. One Microsoft manager, supposedly, questioned adding an e-mail reader, since any one who wanted to do that, could just do it on the Internet. Another story was that Microsoft was a little slow recognizing the Internet, because their managers were too old. They were in their late 20's and when they went to school the net had not progressed that far from the Well in San Francisco. When the young graduates entered the company, they were used to Internet Access from their dorm rooms. MS woke up and swung the ship around almost overnight. After the Executable allow a space and the enter the Switch. The Microsoft Outlook Help file contains an entry that lists command-line switches, which you can use to start Outlook in a specific mode or with a specific form. This article lists additional command-line switches that are not included in the Outlook Help file. Email that includes a Read Receipt request can be a bother. You could click no when Outlook asks to send the reply, or you can set up a more permanent solution. In the Options dialog box, select the Preferences tab. Click the E-Mail Options button. 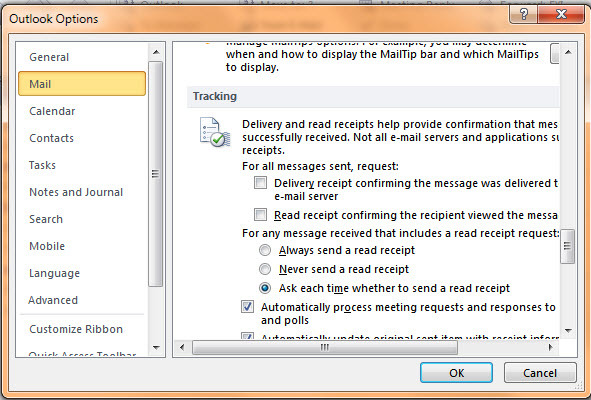 In the E-Mail Options dialog box, click the Tracking Options button. Choose the option Never send a response. When you are poking around in Outlook, you may click on the Journal icon. Resist the temptation. Every Word/Excel/PowerPoint and Access file will be placed on a time line. Every e-mail sent to a Contact will be indexed. This will slow down your machine. It is a massive overkill. If you are involved in a project, you can use Journal to track specific documents. Here is a Microsoft Knowledge Base article on how to Disable Journaling for All Users. Here are some Journal Issues. If you still want to use Journal, here are some references from Slipstick.com. There are ways to see an email header.
. . . you can view the header and source together in the options dialog, if you edit a registry key. This works on mail downloaded from Internet mail transports only, not Exchange server mailboxes. However, if you Access the mailbox using an Internet transport, you'll see the full source. Outlook has a feature functionality for "Search Folders". Search Folders are a kind of new user interface for the Advanced Find functionality, which has been with us through several Outlook generations. The thing that makes Search Folders new and unique is the possibility for defined search criteria to be saved and represented through a kind of virtual folder in the Outlook client. What this means is it gives us a virtual folder view of the content in one or more "normal" folders, for which a search criteria has been defined. Auto archiving of old messages is a two-part process. Go to Tools>Options and choose the "Other" tab. Select where you would like the archive.pst file to be stored and how often you want messages to be moved to the archive.pst file, for instance every 14 days. AutoArchive is a process that searches for folders that have items that need to be saved. Now you need to set up the folders that you want AutoArchive to look at. Go to View>Folder list. Right click on a folder such as Inbox, Family letters, any other directory that you have created. On the Right click Shortcut menu, choose Properties. Put a check next to "Clean out items older than" and choose the time period. You can decide to have items in that folder sent to an archive file of your choosing. For instance older than 3 months. Now ever 14 days AutoArchive will look at the folders and archive files that have become older than 3months. The bounty that is a right click. Right click on the Day planner's time scale to change the scale or Access Time Zone settings. Right click the Deleted Items folder Click Empty Deleted Items Folder on the shortcut menu. Office-Watch is a great newsletter covering Email/Windows/Access and Office in general. Which of these email address (all fake) is formatted correctly? The answer is that they are all strictly valid though they might not be useable in practice. In the Mail Setup dialog box, click Data Files and then click Open Folder. This opens Windows Explorer using the folder where your Outlook Personal Stores (PST) file is located. The default name is Outlook.pst. Back up that file, which contains all your messages, rules, contacts, and appointments." Here's a trick that your manager may find helpful. Instead of asking if a note was sent, theyâ€™ll be able to find it in their own Sent Items folder. When messages and meeting requests are sent by a delegate, on behalf of a manager, a copy of each item is saved in the delegate's Sent Items folder; this behavior is by design. To save sent items to the manager's Sent Items folder and not the delegate's Sent Items folder, the delegate must be logged on as the manager. This may not be acceptable because of privacy or security concerns. By design, items that are sent by a delegate cannot appear in someone else's Sent Items folder. In the Folder List, right-click the Sent Items folder, and then click Properties. Click to select the delegate from the address list, click Add, and then click OK.
Click to select the newly added name, and then click to select the appropriate permission level. Note that the Non Editing Author option is the minimum permission to set. Click Apply, and then click OK. Repeat the previous steps for the Outlook Today root level folder. The delegate can now copy or move items to the manager's Sent Items folder. If you need to send a note to someone on a regular basis, consider using a desktop shortcut. Right click the Desktop and choose New>Shortcut. Here is the command to enter in the "Type the location box". Any Internet address that you type into an Outlook message or other item becomes a hotlink that other Outlook users can use to get quickly to that resource. For messages sent to non-Outlook users, the recipients' e-mail software determines whether the links are hot or not. 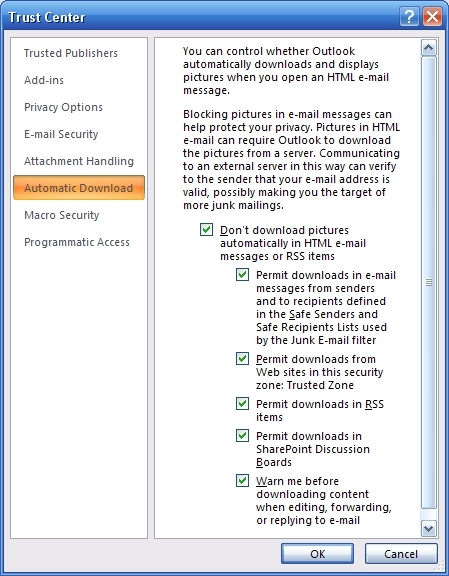 Most e-mail software today supports hotlinks. Just typing an Internet e-mail address does not create a hotlink that Outlook users can click on; you need to use the fully qualified URL with the mailto: or http:// prefix. Outlook folders and items can also be added as hyperlinks in messages and other items.